In general terms, upwellings are powerhouses of nutrient cycling. Driven by wind, the process of upwelling draws deep, nutrient-rich cold water upwards towards the ocean’s surface replacing the warmer, usually nutrient-depleted, surface water. The nutrients in upwelled water are derived from marine organisms (both plant and animal) dying and sinking to the ocean floor. These nutrients are most abundant near coasts and river outlets but may be conveyed by currents great distances along the ocean floor, to be upwelled far from their source. When upwelled nutrients meet sunlight near the surface, minute phytoplankton (plant-like cells) ‘bloom’, turning the ocean green and providing a vital food source for a range of animals from krill (a type of zooplankton) to small schooling fish. These feed larger animals including rock lobsters, giant crabs, fish (including commercial species), squid, seabirds, seals, dolphins and whales. Humans too are part of this complex food web, commercially fishing both krill and the larger predators that feed on it. Upwelling events may last from hours to weeks and are followed by ‘relaxation’ periods as winds calm or blow from other directions. Their timing and intensity varies from year to year. The right balance between upwelling and relaxation events is crucial to primary (phytoplankton) production. The Bonney Upwelling, part of the Great Southern Australian Coastal Upwelling System, stretches from Portland, Victoria, past Robe toward Kangaroo Island, South Australia. It is the largest and most predictable area of surface upwelling in the Great Southern Australian Coastal Upwelling System, one of Australia’s natural marine wonders, which extends from western Tasmania to the eastern Great Australian Bight. Named after the Bonney Coast west of Portland, the Bonney Upwelling is driven by spring-summer winds that blow from the south-east. These winds drive ocean currents to the north-west along the coast and displace surface water offshore (due to the Coriolis effect). This displaced warm, surface water is replaced with cold Antarctic Intermediate Water that has travelled slowly across the floor of the Southern Ocean and onto the shallower continental shelf. The shelf is narrow offshore of the Bonney Coast (about 20km from shore to continental slope) and each season, from November to May deep water is funnelled toward the surface through a series of submarine canyons. Upwelling extends right across much of the continental shelf (waters less than 200m deep) as shown in the map below, but only surfaces in certain areas, such as the Bonney Upwelling, where upwelled water is deflected by the coast. The narrower the shelf, the more intense the surface upwelling. Figure 1. The Bonney Upwelling is the large blue ‘plume’ in the centre of the image, marking the most intense surface upwelling in the large, continuous cool-water upwelling system reaching from western Tasmania & Bass Strait to the eastern Great Australian Bight. This map has been generated by converting ocean surface temperatures, measured by an orbiting satellite with infra-red sensor, into colours that make intuitive sense: the coolest water is shown as dark blue, the warmest as red. Surface upwelling is seen off western Tasmania, along the coast from western Bass Strait to past Robe, SA, off the western end of Kangaroo Island, and off the west coast of Eyre Peninsula. The distribution of about 1,600 blue whale sightings gathered by BWS between 1998-2016 is shown in the following map. Blue whales are a signature species of this upwelling system. 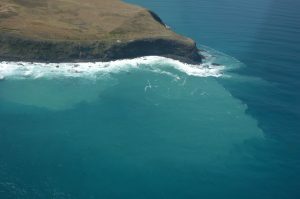 Due to its importance as a blue whale feeding and aggregation site, the Bonney Upwelling has been nationally listed as critical habitat, and requires protection from user impacts. As with all natural ecosystems, upwellings are susceptible to threatening processes. If human activities are wisely and sustainably managed, they pose no threat to natural systems. Such activities include fishing, oil and gas development, and military operations. The potential for ecosystem collapse from overfishing is an ongoing issue Worldwide, upwelling systems provide 50% of the fisheries catch despite occupying only 1% of the ocean surface. 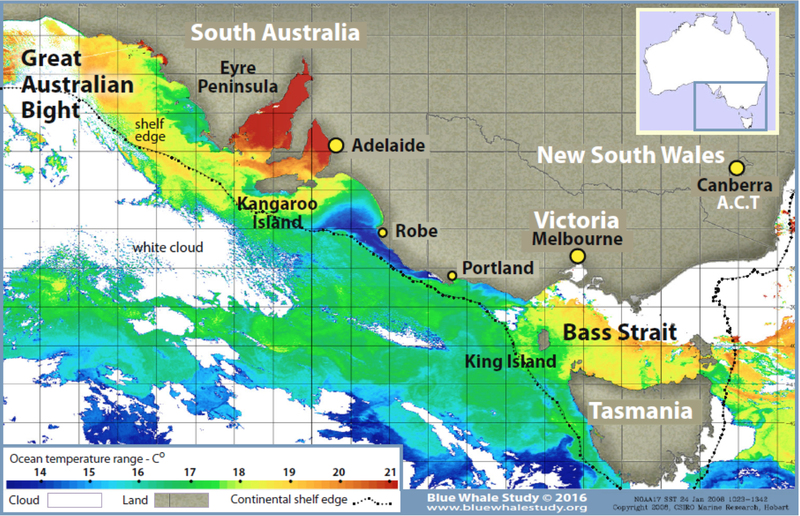 While fishing must be regarded as a potential threat, at this stage fisheries in the Great Southern Australian Upwelling System appear to be sustainably managed. The Bonney Upwelling currently sustains economically important commercial fisheries including rock lobster, bottom trawl, and squid fisheries, while in the eastern Great Australian Bight there is a major sardine fishery, as well as the southern bluefin tuna fishery. 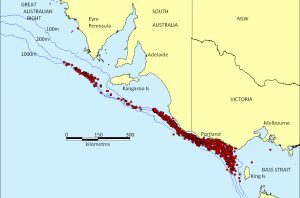 There was a proposal for a krill fishery in the Bonney Upwelling years ago but it did not eventuate. An ongoing risk is posed by oil and gas exploration, with its associated issues of underwater noise, vessel movement and possibly catastrophic oil pollution.The upwelling region has been covered by seismic surveys over several decades, using percussive ‘airguns’ to map subsea geological structures. 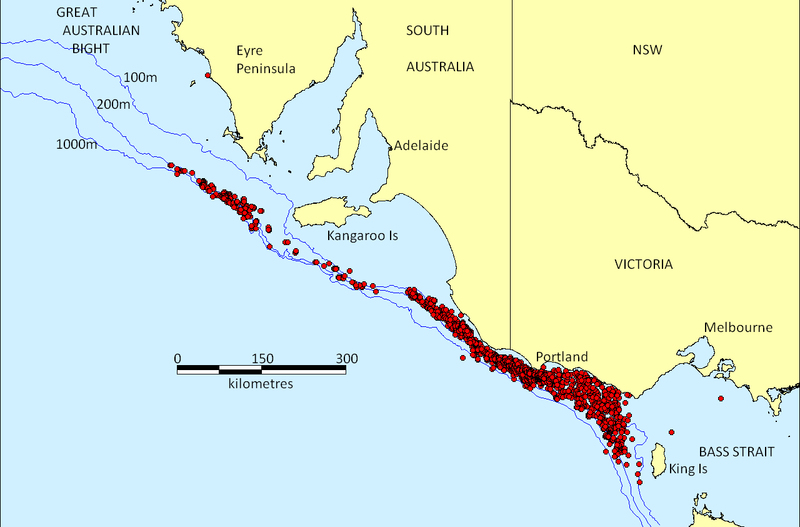 The map below was generated using data provided by Geoscience Australia, and shows 2D seismic surveys up to 2014. It is striking how closely the area most intensively surveyed aligns with the foraging habitat of pygmy blue whales. A major concern is that airgun frequencies closely overlap with blue whale communication frequencies, displacing whales from preferred feeding areas and as has been recently discovered, having adverse effects on other key species such as krill. Ship collisions are also a real threat for marine mammals including blue whales which have limited ability to avoid huge, fast-moving vessels that move daily along these coasts. Climate change is probably the greatest threat to upwelling systems, as it is already changing the ocean’s circulation patterns, heat balance and ocean chemistry. Climatic events such as El Niño are increasing as the earth warms, and may influence the strength of upwelling, though whether they will intensify or diminish upwelling is now yet known; either way may have effects on marine productivity. The long-term effects of these changes may include major changes to upwelling systems, including increased acidification which is already becoming a major physiological challenge to many invertebrates including krill. WW2010 University of Illinois, Department of Atmospheric Sciences. Upwelling: the transport of deeper water to shallow levels. 1998, Geerts, B., Ocean upwelling and phytoplankton. The SeaWiFs Project. Middleton, J.F., C. Arthur, P. Van Ruth, T.M. Ward, J. McLean, M. Maltrud, P.Gill, A. Levings and S. Middleton. 2007. El Niño effects and upwelling off South Australia. Journal of Physical Oceanography 37(10): 2458-2477.